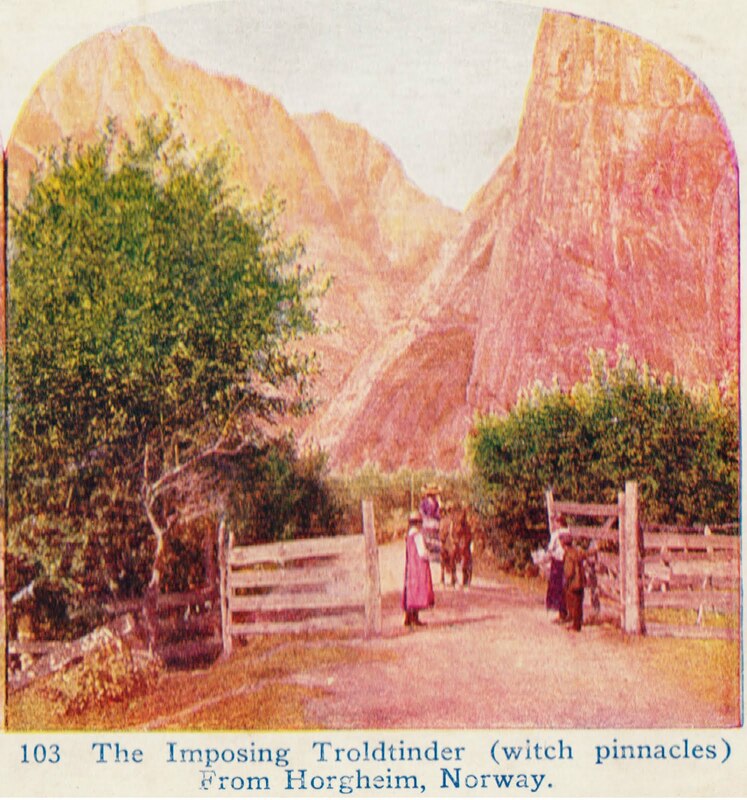 This is a 1925 stereographic card1 of "The Imposing Troldtinder (witch pinnacles) From Horgheim, Norway." 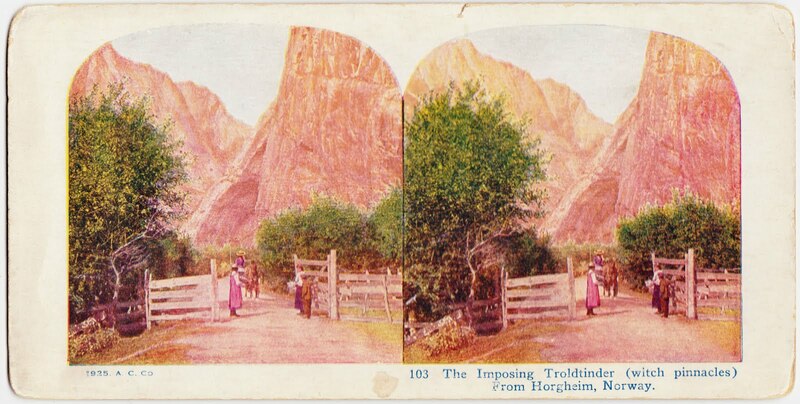 Horgheim is a family farm in central Norway, not far from the Norwegian Sea (Norskehavet). 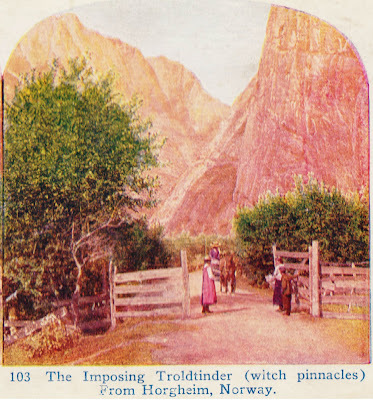 "There are Witch Peaks innumerable in various places in Norway — the name is a favorite one for application to almost any ragged height that has any suggestion of the sinister about it — but these are the Witch Peaks, everywhere acknowledged as having the best title to the name. That long, jagged wall of archaic rock is actually higher than the Romsdalshorn. People say that, after sundown, when those pinnacles stand out against the strange, pale glow of the western evening sky, or, above all, in winter, when their uncanny silhouettes have for a background the weird red flicker and gleam of the aurora borealis, there is something positively unearthly in their threatening beauty. "The post-boys tell one a fantastic tale about how a wedding procession was going down this road one day, long ago — the fiddler, the priest, the bride and groom, and all the guests — when, for some reason, they were all turned to giant shapes of stone. If you are skeptical, they help your imagination by pointing out the resemblance of specific peaks to the different members of the Brudefolge (bridal train)." "Grotesque humanlike shapes assumed by stalactite, flint and flakestone on the small scale, and by basalt and granite rocks on the great, have largely engendered and fed these fancies about petrified giants. Then the myth about stone-circles accounts for their form by dances of giants; many rocks have stories attached to them of wedding-folk and dancing guests being turned into stone." 1. 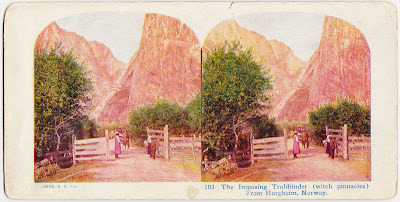 This June 2011 Papergreat post featured a pair of stereographic cards of scenes from along the Rhine. It also delved into the legend of the Mouse Tower. 2. Yes, that is the Jacob Grimm of the Brothers Grimm.